When the demolition of a small scale building or residential property is required then a method statement should be written. 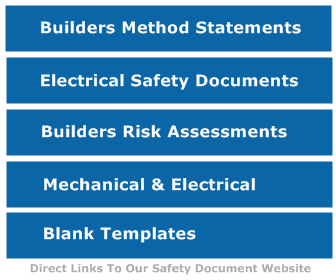 The generic safe work steps of this example method statement are common but the safe work method must be written with all site related safety issues. All existing services will be disconnected from the property and confirmation obtained that all services are no longer live by licensed professionals only. If Asbestos is located then further investigation and safe work method will be determined. If No Asbestos is found then the works will start with a soft strip of all fixtures and fittings including timber windows and floors. These items will be recycled where possible. 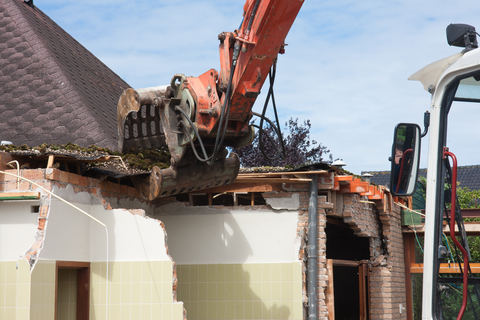 The mechanical excavator will then methodically and safely demolish the dwelling starting from the roof level and working down. A dust suppression system consisting of a fine mist water spray will be available on site if required. Due care and attention will be taken to protect the adjoining dwellings, a supervisor shall observe all works and be in visual contact with the excavator operator at all times. The demolished materials will undergo sorting and salvage once the property has been demolished. All waste products will be disposed of by licensed waste carrier. During the demolition phase the site management will ensure that no portions of the property are left in an unsafe manner overnight. The site is to be inspected each morning before work commences. All person must wear hi-visibility clothing at all times, full personal protective equipment shall be issued and worn, gloves to be suitable for handling glass and other sharp materials. A Banks man will be present during the loading of demolition materials onto trucks. (ensure that traffic management is arranged if required). Whilst carrying out the soft strip state of the contract the structural stability will be assessed. If any section of the building is deemed at risk then all persons will be evacuated and mechanical means used to remove and make safe any required areas of the building. Keeping the work area tidy to reduce the risks of trips and falls.